(Louisville, KY) Former University of Louisville and two-time Super Bowl champ and SB XXXIX MVP Deion Branch announces the date of his upcoming 9 th Annual Skills and Drills Camp in Louisville. Save the date of Saturday, July 21 st at the Baptist Health Performance Training Facility, 12101 Sycamore Station Place. Registration begins at 8:00 am and the camp is from 9:00 am to 12:00 pm. The camp is for youth ages 7 to 18. The registration fee is waived thanks to the Deion Branch Foundation so the camp is FREE but you need to register online. THE CAMP AND SPACE IS LIMITED SO SIGN UP ASAP. Go to www.deionbranchfoundation.org to register. Branch says “This year, I decided to change things up a little to help some youth in the community who’ve really wanted to participate but could not afford the registration fee. We will do some offensive and defensive drills and some NFL and college level conditioning to see what your child needs to work on if they want to play football. This camp gives them a chance to learn proper technique, health and wellness plus sportsmanship.” The Deion Branch Charitable Foundation is a non-profit organization whose mission is to offer support to children’s mental, physical, emotional wellbeing and for those who have been infected with meningitis. The DBCF’s mission is to help with research and to find a cure to ease the struggle for children like Deion’s son. The foundation goal is to assist by providing programs and initiatives aimed at improving their quality of life. We are a 501(c)(3) non-profit organization. 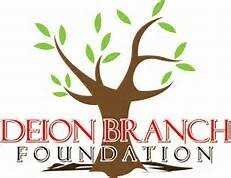 For more information on the foundation go to www.deionbranchfoundation.org. If you would like to be a sponsor and/or donate items for goodie bags, please contact William Hicks at 334-507-3632 or Sherlene Shanklin at 502-295-0435. To register your child for the 9th Annual Skills & Drills Camp go to www.deionbranchfoundation.org and fill out the online registration form. To setup an interview with Deion Branch about the camp held on Saturday, July 21st, please call Sherlene Shanklin, Branch’s publicist at sshanklin@vippcommunications.com or 502-295-0435.